HSBC’S HELPING HAND BOOSTS BOOGIE BOUNCE! Boogie Bounce – the original ‘trampolining to music’ class – is well on the way to becoming a world brand and household name. In a move that every small business owner dreams of Jenny Belcher, Queen of the trampoline and founder of Boogie Bounce, has been given a helping hand up the expansion ladder by HSBC. The financial buffer has enabled Jenny to launch her Boogie Bounce Home Market – allowing bouncers to experience the joy and magic of a Boogie Bounce class in their own homes. Jenny explains: “Boogie Bounce has been transforming lives for 21 years now – with 50,000 people attending classes each week and more than 700 instructors across the UK. “We’ve seen how bouncing has brought miraculous results and improvements in everything from osteoarthritis and obesity to depression and diabetes. Instructors also talk of the joy of being empowered to run their own business and achieve an enviable work-life balance. 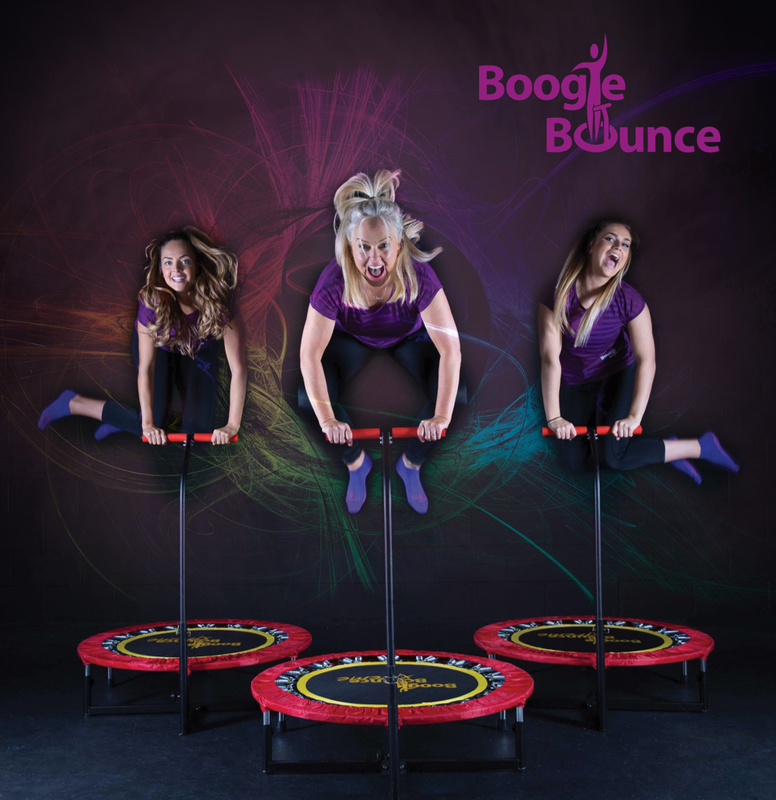 The result was a ‘Home Kit’ – comprising a Boogie Bounce trampoline with T-bar handle, a DVD with two class routines plus three months free access to the Boogie Bounce App to keep home bouncers motivated. “We were able to slowly launch the home market this summer but needed to invest in more stock to really get things moving,” explains Jenny. “We were thrilled when HSBC recognised that we were a strong business with a brilliant idea and a proven track record and agreed to back us." Jenny already has more plans for expanding the business. “We will also be launching a customer services department – offering even more local employment opportunities – and building an exciting new website and app with local companies,” she says. “Even more excitingly, we are finalising arrangements for our launch in the USA – making it our ninth overseas country offering Boogie Bounce. The expansion is a far cry from the company’s humble beginnings in Jenny’s front room more than two decades ago. She had bought a mini trampoline to rehabilitate from a knee injury but found bouncing alone ‘mind-numbingly’ boring. Then she found her two young children on it – laughing as they made up bouncy dance routines to music on the radio. “It was a real ‘lightbulb’ moment,” she says now. “Their simple idea of combining dance with funky chart music provided a brilliant cardio-vascular workout that was safe and fun but also gave unparalleled toning and strengthening benefits. Boogie Bounce is now a family-run business with Jenny working alongside husband Andy and two of their five children - Emily and Sam. Boogie Bounce is an exclusive low impact exercise programme offering cardiovascular, toning, fat burning and strengthening benefits. NASA agrees that ‘bouncing is the most efficient and effective exercise yet devised by man’ – while studies by NASA scientists have shown that bouncing is 68 per cent more effective than jogging but requires less effort.